Today’s gospel contains some powerful words that should make all Catholics fall to their knees in gratitude. We have a gift that many prophets and kings never got to see while on earth. 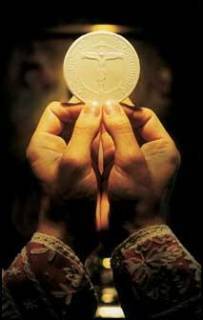 Jesus Christ, Our Lord and Savior, is fully present in the Holy Eucharist. It’s really Him – Body, Blood, Soul and Divinity! How can we ever have a bad day?